My husband has a very high pressure job and so I bought this for him to use. A must-have for your purse! Such a simple way to carry around the best headache blend ever! 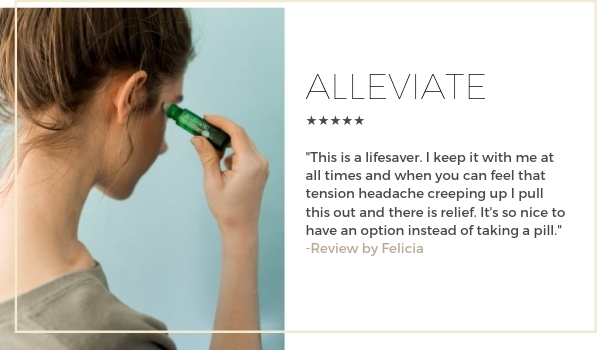 I love love love my alleviate, and the alleviate sensitive that comes ready to us! When I need some tension relief, this is my Go to!! I have it in my purse, at home, and in my desk drawer at work! I don't go anywhere without this oil!!! Smells good and definitely helps! This is a lifesaver. I keep it with me at all times and when you can feel that tension headache creeping up I pull this out and there is relief. It's so nice to have an option instead of taking a pill. This blend has helped me with my tension headaches. I love that it is in a roller ball and easy to use. My favorite blend! I use it for tension headaches, as well as migraines. It also works well for relieving tension in my neck and shoulders. Always have this roller with me. Absolutely one of my favorites! I love the roller and does seem to actually help when I have headaches. Love the roller bottle as well. I love the smell of Alleviate, and use it sometimes just for a jolt as a change up to boost, Well-Being, and Focus. I am fortunate not to get a lot of headaches, but haven’t had a lot of success for this purpose, but it does remove general tensions. I always have around! I love the roll-on with the use of grapeseed oil as the carrier, as it absorbs without a residue. I bought this for my husband's migraines. He loves the smell and it really seems to help ease the most intense part of the pain. I love this blend. It just simply isn't strong enough for me, personally, in the sensitive version. However, I know others it works wonders for. I still use it when I feel a headache (not migraine) coming on, as well as take other measures. It's not magic but a good tool to have in your bag. Also, I have used it on my teenage son and it helped him. So, again, everyone is different, and I'm glad I have it. I got this blend specifically for me, as I get headaches frequently. Since I've gotten this, I've not had to use it. Both my boyfriend and my daughter have used this oil multiple times since I got it. Both are relieved of pain in about 15 minutes. Neither have used ibuprofen or acetaminophen since I got thus oil. I highly recommend this product for anyone who gets headaches. I bought this as a gift for my mother, she has frequent headaches. When she opened the package and then rolled it one she was instantly in love with this product. I have purchased roll ons here and the Alleviate oil. I love the Jade bloom oils; however this delivery system is not as good. Because it's "sensitive" not enough oil comes out to be effective. Not happy I bought this. I enjoy this oil in the rollerball for my temples and neck when I have a headache. However, I found it best relieves the pain with the rollerball and diffusing. I ordered this because I am a headache/migraine sufferer. While this oil i believe is better than nothing, I havnt found it to be all that life changing, but thats ok!